I'm posting later than usual today. It's partly because I was scurrying to finish tomorrow's swatches and also because...well...I don't like writing negative reviews. It's like breaking bad news. I want to love every single polish I try and then glowingly recommend it to you. I get to do that pretty often, but then there are times like this. Today I feel extra bad about it. 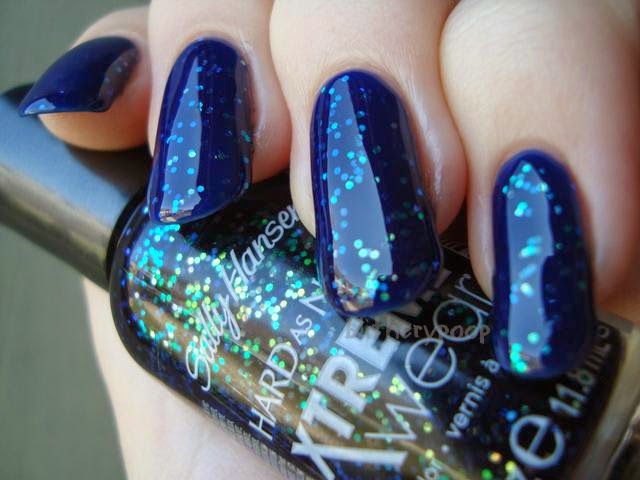 It's not just one polish, but a reformulation that I have to be unflatteringly honest about. Sally Hansen has apparently changed the base they use for new glitters in their Xtreme Wear line and...it's just no good. I adore Sally Hansen in general, so this really bums me out more than the usual negative review. I even gave the polish a second chance. You'll see why...in a moment. Better photo first, to ease you in. 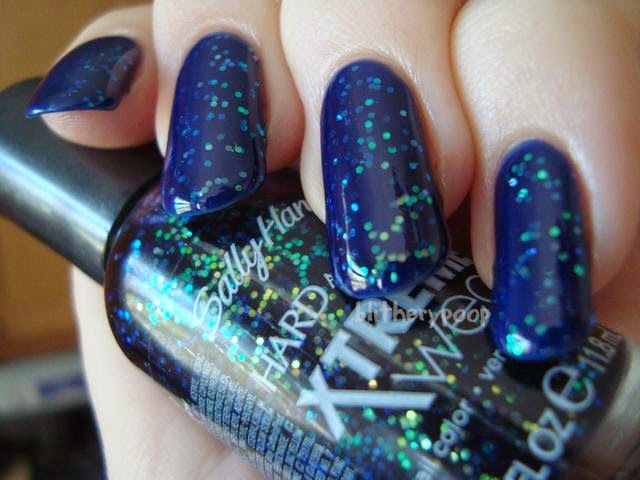 Indi-glow has small orange/green/blue iridescent glitter in a cobalt blue jelly base. This, sadly, is one of the better photos. It's from that second attempt I mentioned. I thinned it and applied two coats over OPI Dating A Royal. I originally did three coats on its own (with base and top coats) and...um....yeah... It wasn't good. The depth and glassiness is better on its own at three coats like this, but it was incredibly frustrating to apply. It was gloppy, gluey, thick, and stringy. Then it shrank at the tips when I top coated it. Ugh. It's such a shame too, because it's pretty. I mattified it despite all the problems...and it just amplified them. On top of everything else, it also bubbled. Bleh. As you've seen, I had better results when I reswatched....but it still isn't good. Thinning improved the application, but it still wasn't great. It took a little dabbing to get the glitter to look even. At least it didn't bubble this time. I'm still not happy with the result. It's so thick! Dating A Royal needed three coats, so that's part of the issue. If you thin it and put it over a one-coat base and hope for the best, you might get a better result...but you'd probably be better off just doing a jelly sandwich with a similar glitter and jelly. Bottom line: I really hate to say it, but steer clear unless you absolutely love how it looks and are exceptionally patient. What's worse, I've gotta say you should think really hard before buying any other glitters from the Glitter Mania or Passport To Rio collections. They all seem to have this unfortunate new base and it is just no good. I hope they go back to the one they used to use. Last fall's collection was great, so this is extra disappointing. Have you bought any of these new glitters? Did you have the same problems? I was disappointed with this too. When I saw this polish I had to buy it. I got it home and immediately did a mani with it. I couldn't stand the way it looked and ended up removing it the next day so no one would see it. I read Nouveau Cheap's review of these polishes and she said they were not good too. I am so glad I did not get one the other day at Rite Aid. I would be pissed! I had to add a lot of thinner to make mine work well. Despite the formula, I bought a second bottle to franken and do some jelly glitter sandwiches. I bought this one and the silvery sparkly one when I first spotted them. I didn't think twice about it, because they used to be a no brainer and fantastic. Thankfully they were on sale, so no harm no foul, just a crappy formula. Lesson learned, always wait for swatches and reviews. Bummer. Between this and the watery "jellies" I'm not sure what's going on with Sally Hansen.